For the first time ever, researchers have successfully demonstrated a system that enables a person to move the individual fingers of a prosthetic hand using just their thoughts. To test the device, scientists at Johns Hopkins University recruited the help of an epilepsy patient who was preparing for surgery to pinpoint the source of his seizures. (The patient himself was not missing a limb.) The scientists used the same electrode array implanted in his brain to control the prosthetic limb. After mapping the parts of the brain responsible for individual finger control movements, the researchers programmed the prosthesis to move the corresponding finger. The details of the experiment can now be found in the Journal of Neural Engineering. “We believe this is the first time a person using a mind-controlled prosthesis has immediately performed individual digit movements without extensive training,” said senior author Nathan Crone in a press statement. “This technology goes beyond available prostheses, in which the artificial digits, or fingers, moved as a single unit to make a grabbing motion, like one used to grip a tennis ball. The array of 128 electrode sensors was placed on the part of the brain responsible for hand and arm movements. 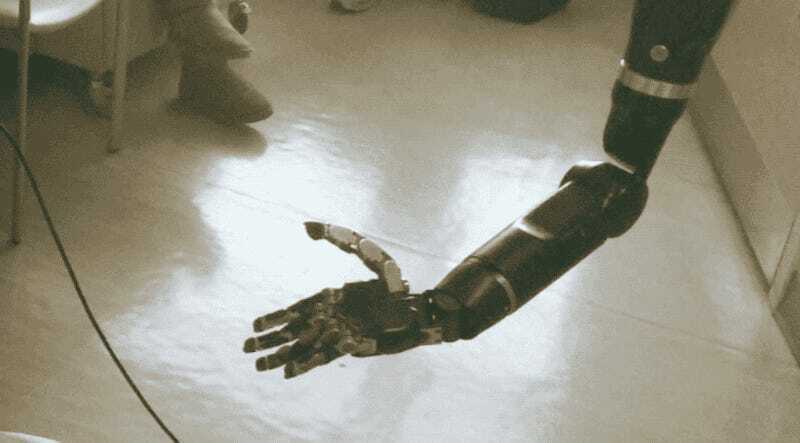 A computer program was used to interpret the data streaming from the implant, triggering the individual fingers to move. Initial accuracy of the system was 76 percent, but refinements allowed the researchers to bump it up to 88 percent. The part of the brain that controls the pinkie and ring fingers overlaps (which explains why many people move them together). By coupling these two fingers together, the researchers were able to improve overall accuracy. No pre-training was required for the patient to familiarize himself with the device, and the whole thing took less than two hours. It’s all very exciting and impressive, but the researchers say it’ll still be many years and many more refinement before we see the technology move to prime time.